It’s a crucial time of year for many people. You may have made a resolution to eat healthier in the new year. For the first few days, egg whites, wheat toast and packets of oatmeal seemed satisfying. But after a few days, those things began to seem boring. 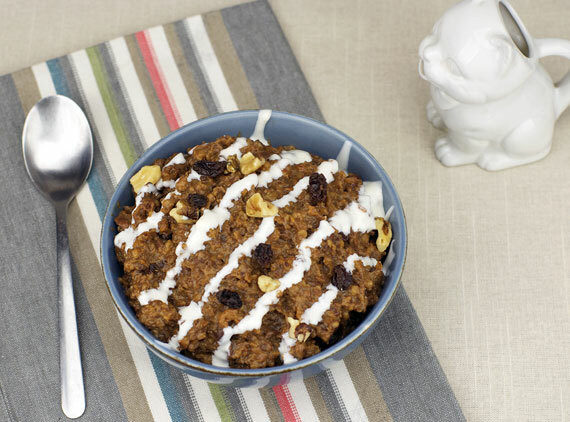 I have a solution for your resolution… an oatmeal revolution… Crock-Pot Carrot Cake Oatmeal with a decadent Cream Cheese Frosting Drizzle. I’m ahead of the game resolution-wise. I resolved to eat more oatmeal and use my crock-pot more. Before we start…. an admission. If you make this without the drizzle, it’s not as special. It tastes fine but lacks a certain joie de vivre. But as soon as you add the Cream Cheese Frosting Drizzle, magic happens. It immediately starts to taste almost exactly like carrot cake. For the short and sweet, printable recipe, click here. The ingredients list is long, but the cooking process is amazingly simple. 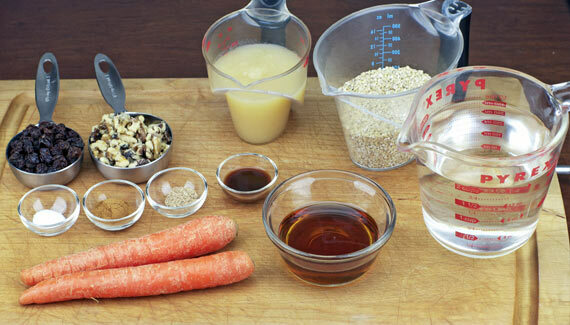 Grab a couple grated carrots, some steel cut oats, water, maple syrup, applesauce, raisins, chopped nuts, brown sugar, salt, cinnamon, nutmeg and vanilla. Chuck all that stuff in a slow cooker. Give it a stir and then cook on low for 8 hours. After 8 hours, stir it up – adding a little milk until the consistency is just how you like it. 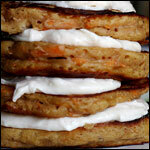 Top each serving with a little Cream Cheese Frosting Drizzle. To make the Cream Cheese Frosting Drizzle, just take some cream cheese, confectioner’s sugar, milk, vanilla and salt and whisk it up until a smooth frosting forms. Add just enough additional milk so that it drips off the whisk in thick stream. Dribble that good stuff over each serving and prepare to be dazzled. It’s a good idea to have your cream cheese at room temperature. The drizzle comes together much easier that way. Another thing I like to do is place my mixing bowl over a pan of warm water. A little gentle heat makes the mixing go smoother. Over the years, I’ve learned that crock-pot recipes work only as good as your crock-pot works. In so many recipes for slow cookers, you see a huge dichotomy in the comments and reviews. The same recipe can work to perfection for half the people. The other less fortunate half report scorching and crusty edges. In most every case, the disappointed have crock-pots whose low setting cooks too high. The solution is to get to know your slow cooker. Like it or not, I know that 3/4 into the cooking time I need to stir the ingredients and probably add a little more liquid. People with awesome crock-pots can sleep through an 8 hour cooking time. Not me. I have to set an alarm and wake up two hours earlier. I’ve learned to live with it. 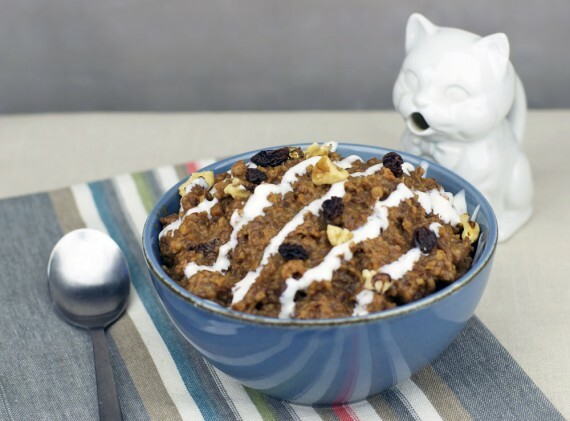 In short, check this oatmeal after 6 hours if you have any doubts about your crock-pot. If the sides and bottom are cooking too fast, give everything a stir and add a few more tablespoons of water. 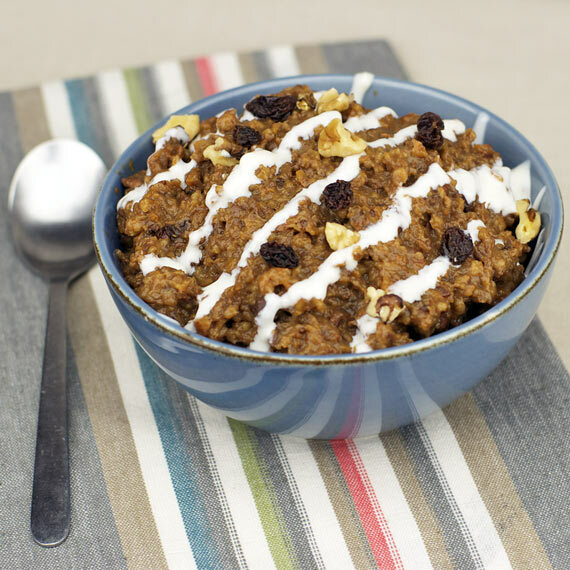 For over 140 more oatmeal recipes, check out The Oatmeal Collection on MrBreakfast.com. sounds perfect for Easter weekend! I think you’re right. I love how you’re already thinking of Easter breakfast. Way to plan ahead! Carrot cake is the only dessert type food I like other than Jell-O cake, and I am a cereal killer, so to combine the two… my god I am in love. If you’re going to fall in love with oatmeal, this would be a good one to do it with. 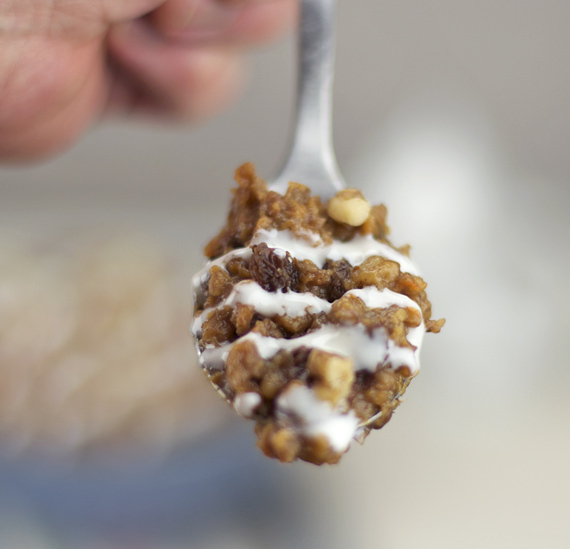 You’ll be the first to know if I ever do a Jell-O cake oatmeal. 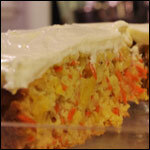 Carrot cake is my favorite dessert! I can’t wait to try this recipe!!! !